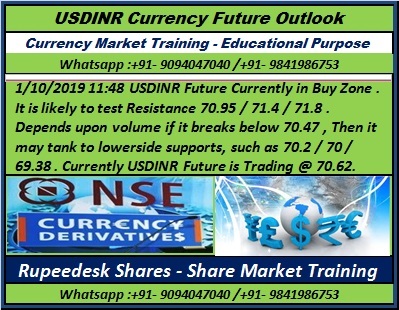 1/10/2019 11:48 USDINR Future Currently in Buy Zone . It is likely to test Resistance 70.95 / 71.4 / 71.8 . Depends upon volume if it breaks below 70.47 , Then it may tank to lowerside supports, such as 70.2 / 70 / 69.38 . Currently USDINR Future is Trading @ 70.62.